This week, we’re going to prove once and for all that veganism is affordable! Risotto might not be top of mind when you think of budget meals, but hear me out. What better way to glam up the floppy carrots, wilty greens, and otherwise less-than-perfect produce languishing in your crisper drawer than by throwing it all in a pot of creamy, rich rice, a dish that’s more than the sum of its parts? Sure, you could make a stew or a soup or a chili, but risotto is just a little fancier, a little more elevated. In my kitchen sink, crisper drawer, leftover-friendly risotto, I used carrots, okra, and kale that were past their prime. 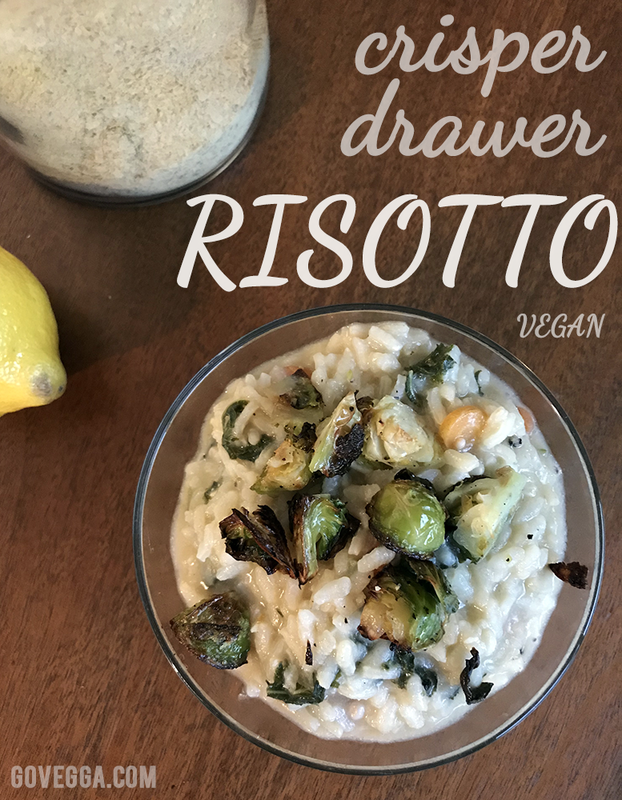 I chopped them all up small and cooked my rice in vegetable broth, adding vegan butter towards the end for extra richness, then topped my dish with roasted Brussels sprouts for added texture, nutrition, and deliciousness. A squeeze of lemon brought it all together, adding a little acidic punch to the savory dish. Risotto is NOT as intimidating a dish as many folks make it out to be, and it’s just about guaranteed to taste good no matter what you throw in it. (Just be sure to cook those grains until they’re soft.) And if arborio rice is not in the budget, try it with any short-grain rice: They are a fine stand-in for arborio if you cook ‘em low and slow with lots of liquid. Toss trimmed and quartered Brussels sprouts with a little oil, salt, and pepper, then tip onto baking sheet. (I don’t usually line my sheet; the oil prevents sticking and I actually like the near-burnt bits on my sprouts!) Place in preheated oven and set timer for 15 minutes. When the oil in the pot is just shimmering, add the chopped vegetables and cook for a couple minutes, then add the sliced garlic and cook for about 2 minutes, just until the garlic begins to turn golden. Add the rice and stir so that the rice is coated with the oil, veggie, and garlic mixture. Add a cup of the vegetable broth and stir to combine. Over the next 20-30 minutes, keep checking the rice and adding more broth as it starts to get soaked up. Give the rice a good stir every couple minutes, but don’t feel like you need to stand over the pot the entire time. You might not use all the broth, and that’s okay. Bonus! If the leaves of your sprouts start to burn in the oven, just scoop them out with your spatula and give yourself a little mid-cooking treat. They are like crispy little sprout chips. Taste the risotto as the rice begins to soften to test whether it’s done. Towards the end of the cooking process, add the nutritional yeast, salt, pepper, and any additional spices you want to try. Turn off the heat and stir in the vegan butter (if using). 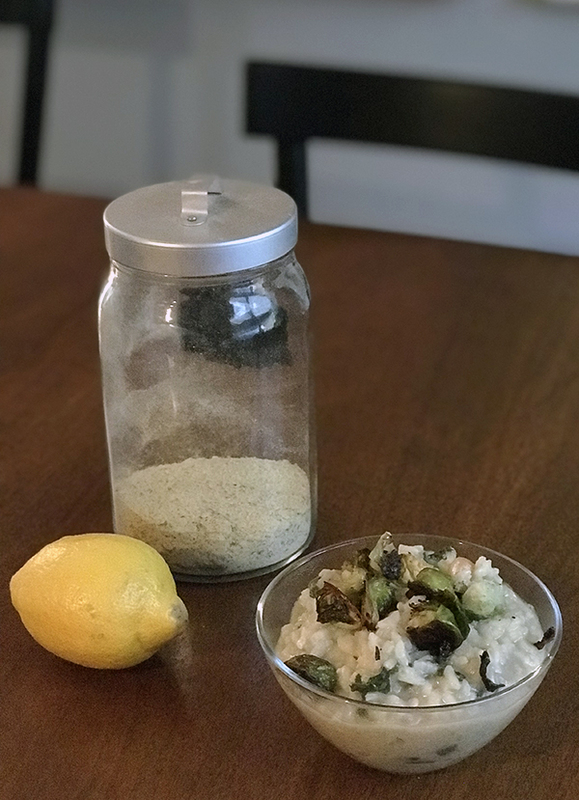 Drizzle with lemon juice, top with roasted Brussels sprouts, and serve right away. Use whatever veggies you have available. They likely won’t add a ton of flavor but will provide fiber and nutrients while bulking up the rice. Increase the garlic to as many cloves as you’d like, or substitute with diced shallots or onions. Do try to use at least one allium, though! If you want to cut down on the veggie broth (or don’t want to make too much and waste it), you can use hot water and just add a bouillon cube to the risotto to taste. Feel free to swap out the crispy roasted Brussels sprouts for another roasted veggie (like broccoli) or something crunchy (like toasted nuts). You don’t absolutely have to use a crunchy, crispy topper, but I think it provides a really nice textural counterpoint. Check out my Butternut Squash Risotto with Sage and Toasted Hazelnuts for another take on risotto, and share your favorite risotto recipe with me!